The goal of the ISSF 2018 Poster and Research Presentation session is for students to present project and research work from their home schools across a variety of subjects. This will foster opportunities for students to develop their learning, presentation skills and share with the ISSN community their projects. 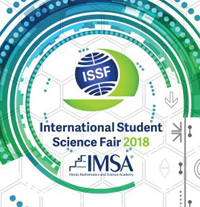 IMSA believes that these sessions will provide the impetus for students to build international and interdisciplinary relationships during ISSF, that will continue after ISSF with students collaborating and sharing into the future. During ISSF students will share research presentations with their peers and attendees. The research presentations will be held on Saturday, June 30th and each presentation reviewed by three evaluators. Student research awards will be presented during the closing ceremony. Research presentations will be presented across a variety of subjects such as Biology, Chemistry, Computer Science, Earth Science, Engineering, Environment, Mathematics, Physics, Robotics and other related fields. Judging Criteria for Presentations ~ Conventional format of academic presentation, oral sessions include a 10 minute-talk and a 5 minute Q&A for each team. Presentation Format ~ Students can use either of these formats for their PowerPoint presentations: 16:9 or 4:3 (aspect ratio). How Do Different Levels of pH Affect the Growth of Heritage and Regular Radish Plants? The Effect of Sweeteners in Drosophila Melanogaster's Locomotion. De-icers: What is safe for the environment and is effective? Study of the visual adaptation mechanism in marine species with the change of habitation depth. Investigating Sports Drinks. Are they worth the money?